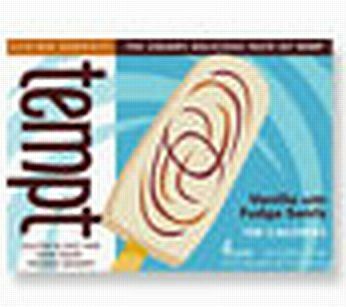 I picked up hemp ice 'cream' bars by Tempt in the fudge swirl flavor last night. They were new to the store and I was curious about them. I am not a big ice 'cream' person due to the fact that the cost is so high and I rather have something to enjoy with tea. A box of 4 costs around $5.50 so it was a splurge. I had one last night and it made me think of old school pudding pops! I liked how creamy they were! The flavor was really good and lacked that odd taste you sometimes get with non dairy ice creams (that tangy taste)...Plus each bar only has 100 calories - perfect snack size!